Check the Fien Print: MovieWatch: "No Country For Old Men"
In a Nutshell: An insight into my upbringing... I mention to my mother that the weekend plans will probably include going out to catch "No Country For Old Men." She responds by sending me an URL to William Butler Yeats' "Sailing to Byzantium," the poem which gave Cormac McCarthy the title for his novel. Nice stuff. Check it out. You could also check out McCarthy's book, though the Coen Brothers film is a slavishly literal adaptation at times, taking imagery and dialogue verbatim from the source. Sometimes when filmmakers over-adhere to the integrity of a literary source, the resulting movie comes across as embalmed, like they failed to recognize that books and movies are different art forms and require different discipline. In this case, though, it's just an example of a perfectly simpatico combination of filmmakers and book. Just because McCarthy's novel is cinematic, doesn't mean it should inherently be good cinema. Follow through after the bump for the usual rambling. A frequent Coen Brothers theme has been how real people respond when movie-style hijinx encroach on their lives. Think Marge Gunderson in "Fargo." Like Marge in "Fargo," Tommy Lee Jones' Ed Tom Bell is in a profession that seems Hollywood-ready, but even though he's a Texas sheriff, he's unaccustomed to extreme drama. The thing that makes Ed different from Marge is that he's part of a long line of Texas lawmen and, as such, everything he does is infused by the heroics of the past. That past is a time where the guys in white hats shot the men in black hats and even if the men in white hats died, they died with heroic stories, they died for a reason. Set darned quaintly in 1980, "No Country For Old Men" is an elegy about how those old rules of Western nobility and principle no longer apply, that the present belongs to young folks, that it's... well, you can read the title. The movie is a logical successor to "The Searchers" to "The Wild Bunch" to "Unforgiven," but the semi-contemporary time frame changes its revisionist Western slant. Because the book and movie are about an old world on the brink of extinction, the challenge for the Coen Brothers is deciding which conventions of the genre they want to deliver on and where they want to clearly depart. Although the film's body count is impossibly high and the gore is extreme (this is "No Movie For Little Kids"), the Coens follow McCarthy's template by cheating expectations on a few key casualties, either the way they're shown or the way they're not shown. I'm not going to spoiler anything, but expect to feel curiously unsatisfied at several junctures. That's the point. While the blood and guts flow freely, "No Country For Old Men" finds the Coens in positively subdued form. Although it's being compared to a return to their "Blood Simple" roots, the movie is lacking in the sort of oddball camera movies and cheeky points-of-view that folks expect from the Coens and while there are certainly laughs, nobody should go in expected dark comedy. And just because the movie isn't showy doesn't mean that Roger Deakins' cinematography is anywhere below the incredibly high standard he's set for the Brothers dating back to "Barton Fink." Chigurh is that rough beast, that apocalyptic creature feeding on the detritus of soulless modernity. He's a man of horrifying principles, not even close to a lunatic. Whatever he is, Bardem plays it to the hilt. Bardem's difficulties reading phonetic English crushed John Malkovich's "The Dancer Upstairs" (I'd love to see Malkovich reshoot that movie in Spanish), but here, his discomfort with the language is an asset. Just as his motivations aren't over-explained, nothing of his background is explained, but Bardem's intonation, his posture, his Prince Valiant (or Dorothy Hamill?) haircut), his haunted eyes just enhance the mystery. For every second of the movie, whether he's in the scenes or not, he's the dominant figure in "No Country For Old Men," which is why he'll almost certainly be positioned for best supporting actor Oscar. It's a confusing movie for Oscar voters. Bardem is the star, but Josh Brolin is probably the leading man. And I'd appreciate if somebody would write a really smart article about how, in the course of just a few weeks this fall, Josh Brolin has gone from a somewhat hammy pretty boy, Babs' stepson or Diane Lane's main squeeze, to being a compelling actor. I mean, good gravy, did anybody see "Into the Blue"? His performance in that movie is hilariously awful. But since last spring, he's transitioned from effective self-parody (in "Planet Terror") to just-plain good (here, "American Gangster" and fleetingly in "In the Valley of Elah"). All you need to say about Brolin's performance is that he doesn't get lost between Bardem and Tommy Lee Jones. Because if Bardem is the movie's star and Brolin's the leading man, then Jones is the hero. See how Oscar voters might be in a bind? My initial reaction: I've seen Tommy Lee Jones do this before. Laconic law-man? World-weary Texan? Gruff but fatherly many with old-school values? Check, check and triple-check. But as I watched, I came to a second conclusion: Why do I care if he's done it before, if he does it so well every time and if he so rarely just phones it in. In general, "No Country For Old Men" makes a nice companion piece to Jones' underrated directing debut "The Three Burials of Melquiades Estrada" and his performance here is a good compliment to his performance in that film. As I like to periodically mention, the marketing/publicity/awards team at Sony Pictures Classics should still be embarrassed for failing to get Jones a best actor Oscar nod for "Three Burials." But that's a rant of a different color. The supporting roles are all well-filled. Who'd have guessed that Kelly Macdonald, so loveable for her Scottish accent, would be so good as a spunky Texas rose? Many viewers are likely to find the scenes between Macdonald and Brolin to be the movie's best. Woody Harrelson, Garret Dillahunt (Anybody seem him on "Life" two weeks ago? Amazing), Stephen Root, Tess Harper and Barry Corbin (sharing a single scene with Jones for the second time this fall) are all memorable. Look, I could either continue to rave, or I could watch my DVRed "Friday Night Lights" and "Moonlight." 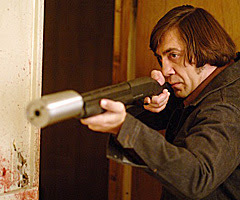 Let's just say that as of now, "No Country For Old Men" moves to the top of my Best of 2007 list.